Nearly every child loves to spend time at a playground, whether at the local school, park, or on private property. Unfortunately, a day of fun outdoors can be interrupted by a serious injury if proper precautions are not taken. In fact, over 200,000 children under the age of 14 are sent to emergency rooms every year for injuries sustained on playgrounds. Playground-injury lawyer Jeffrey Killino has an established reputation for obtaining compensation for children injured by unsafe toys and equipment. If your child has suffered a preventable injury on a public or private playground, Attorney Killino can help you win the compensation you deserve. Approximately three-fourths of all playground injuries occur on public spaces, while only one-fourth occur at home. The most common playground injuries are fractures, lacerations, and contusions. Most playground deaths are caused by strangulation, and the second-greatest number by falls. Children between the ages of 5 and 9 are at the highest risk for these injuries. Of all the equipment on public playgrounds, climbing equipment was named as the most dangerous toy. Many playgrounds are owned, operated, and maintained by governmental entities such as states, counties, townships, or towns. Others may be owned by private schools, daycare centers, other privately owned businesses, or homeowners’ associations. Though laws vary from state to state, most employ a negligence standard when determining liability for injuries sustained in playground accidents. Thus, whether private or public, individual or corporation, managers and employees of playgrounds, and those who own or maintain them, owe a duty of reasonable care to those who use such playgrounds to keep them reasonably safe and free of injury-causing dangers. The duty may include keeping the grounds free of sharp objects, broken glass, rusty metal, and other objects that can cause injury to a child. 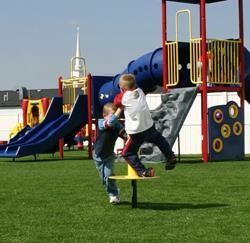 Surfaces should be maintained to eliminate uneven walkways or play areas that might cause a child to trip. Equipment should be inspected and kept in proper working order. The duty of care owed to playground-users includes the duty to make the playground reasonably safe for children with special needs if such children are invited onto and known to use the playground. Individuals responsible for supervising children on a playground also owe a duty of reasonable care to keep those children safe from harm while they are under their care. The amount of attentiveness required to satisfy the duty of care will vary with the children’s ages and with whether or not the children have special needs. In some circumstances, playground injuries sustained by children may also give rise to product liability actions. If a defect in the design or manufacture of playground equipment is a cause of a child’s injury, the manufacturer of that equipment and/or its component parts, and anyone in the chain of distribution thereof, may be found strictly liable for the injuries caused by that defect. Defects may also result from a failure to provide proper warnings regarding safe use of playground equipment or adequate instructions for assembly. If playground equipment that has been defectively designed results in an injury to your child that was sustained as a result of the defect, the manufacturer and anyone in the chain of distribution may be held liable in damages for the injuries your child has suffered. Examples of design defects in playground equipment might include a sliding board without hand rails to which a child can hang on when at the top of the sliding board. The design of the sliding board without the protective hand rail makes the product dangerous for the children who use it, thereby leading to liability under product liability law. If playground equipment has been safely designed, it may still be defective if it has been manufactured with a defect that renders it unsafe. A merry-go-round may contain a manufacturing defect, for example, if bolts or other hardware have been improperly fitted or attached. Playground equipment may also be found defective under a failure-to-warn theory. If a manufacturer or seller of equipment fails to include warnings regarding the age group for which the equipment can be safely used, the playground equipment may be found to be defective as a result. If your child has been injured by defective or poorly-maintained playground equipment or negligent playground supervision, you may have grounds for civil action against those responsible. Call experienced playground-injury attorney Jeffrey Killino at 877-875-2927 for assistance in vindicating your rights.